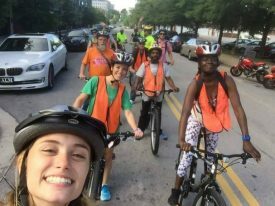 TAMPA, Fla. – The IRONMAN Foundation® will partner with My Own 2 Feet & Wheels, a running, walking and biking program created to support and motivate the Chattanooga homeless community with a Community Grant to purchase new bikes and running equipment. In addition, The IRONMAN Foundation will distribute $50,000 in charitable giveback to non-profit initiatives and groups in the Chattanooga region in conjunction with the 2017 Little Debbie IRONMAN® Chattanooga triathlon presented by McKee A Family Bakery taking place on Sunday, September 24. The IRONMAN Foundation’s overall giveback in Chattanooga in 2017 will be $126,500, bringing the total awarded to-date to $351,500. In addition, a Community Grant will also be awarded to the Ridgeland High School JROTC in Rossville, Georgia. The grant will provide new equipment and support their program to develop citizens of character dedicated to serving their country and community. Both grants will be awarded at the Welcome Ceremony on Friday, September 22 at 6:00 p.m. at Ross’s Landing. The IRONMAN Foundation Community Fund provides community and volunteerism grant opportunities to non-profit organizations where IRONMAN events are held. In 2017, The IRONMAN Foundation will distribute more than $1.5 million in grant funding to support the needs of IRONMAN race communities across North America. A Wanda Sports Holdings company, IRONMAN operates a global portfolio of events that includes the IRONMAN® Triathlon Series, the IRONMAN® 70.3® Triathlon Series, 5150™ Triathlon Series, the Rock n’ Roll Marathon Series®, Iron Girl®, IRONKIDS®, International Triathlon Union World Triathlon Series races, road cycling events including the UCI Velothon Majors Series, mountain bike races including the Absa Cape Epic, premier marathons including the Standard Chartered Singapore Marathon and other multisport races. IRONMAN’s events, together with all other Wanda Sports Holdings events, provide more than a million participants annually the benefits of endurance sports through the company’s vast offerings. The iconic IRONMAN® Series of events is the largest participation sports platform in the world. Since the inception of the IRONMAN® brand in 1978, athletes have proven that ANYTHING IS POSSIBLE® by crossing finish lines at the world’s most challenging endurance races. Beginning as a single race, IRONMAN has grown to become a global sensation with more than 200 events across 50 countries. For more information, visit www.ironman.com.